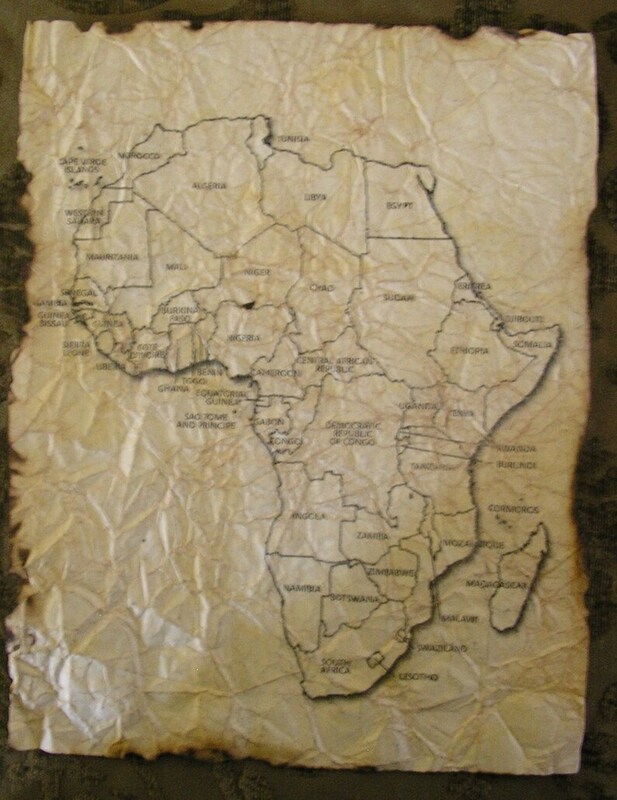 Whether you're designing an original scrapbook page, an exciting treasure hunt or creating your own piece of art, you'll find these maps of Africa, hand antiqued sheets of paper incredibly fun to work with. The four step aging process transforms regular parchment paper into paper that looks hundreds of years old. It not only LOOKS antique…but it FEELS antique, as well! Although it's difficult to truly catch with a camera, the second image reveals that there are subtle veins of shimmering gold worked into the page for a truly special look! These sheets come in packages of 10 and are 8 ½ x 11 inches in size. These will bring a look of real authenticity to any Indiana Jones, class activity or other historical project you might be working on. Each nation of Africa is labeled on the map. See our store for a blank African map version! Each sheet of paper is hand treated in each of the four steps of the aging process. The paper has a definite uneven texture that makes it fun handle, but also makes it unavailable to run through computer printers. Please keep this in mind before you consider ordering. As a professional treasure hunt designer, I've experimented with and built on this antiquing process for over 30 years and am very excited over the results it achieves. If you have any questions, I'd love to answer them! View our store to see other themes including Celtic, Egyptian, blanks sheets and maps! Interested in us antiquing YOUR documents? Have your own treasure hunt maps, treasure hunt clues, party or wedding invitations that you'd like to look authentically aged? For more information on placing quick and easy custom paper aging orders, see our store for CUSTOM PAPER AGING ORDERS! Exactly what I needed for my work scavenger hunt. Thank you Quest! A lot of fun! Printed the cards on thick card stock. Perfect for our golf birthday party! Perfect game for my 7 year old grandson's birthday party.